When we say this wasn’t your average Vegas trip, we mean this wasn’t your average Vegas trip. Like, we didn’t gamble once or go to the strip. We did, however, hike, climb, do yoga, and eat REALLY good food. As you can probably tell, we’re not really a Vegas kind of crew over here at Fit Foodie HQ. 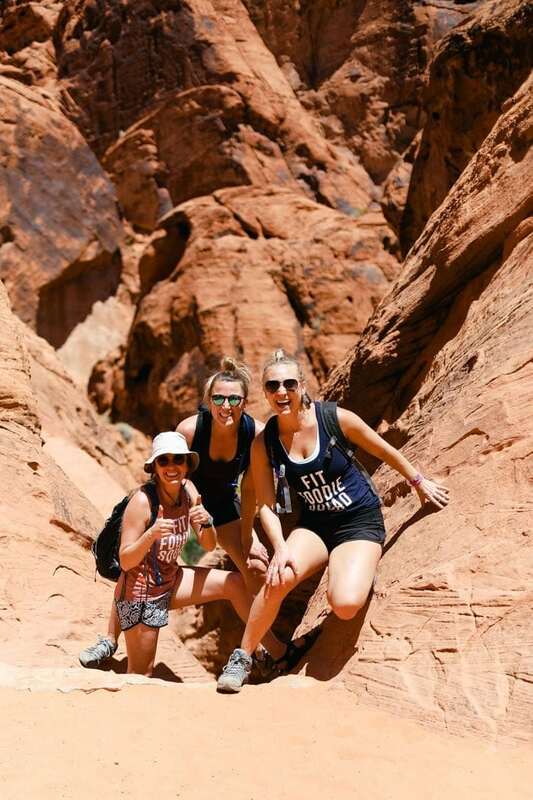 We are, however, down to get outdoors and have one hell of a Vegas trip…not in Vegas! 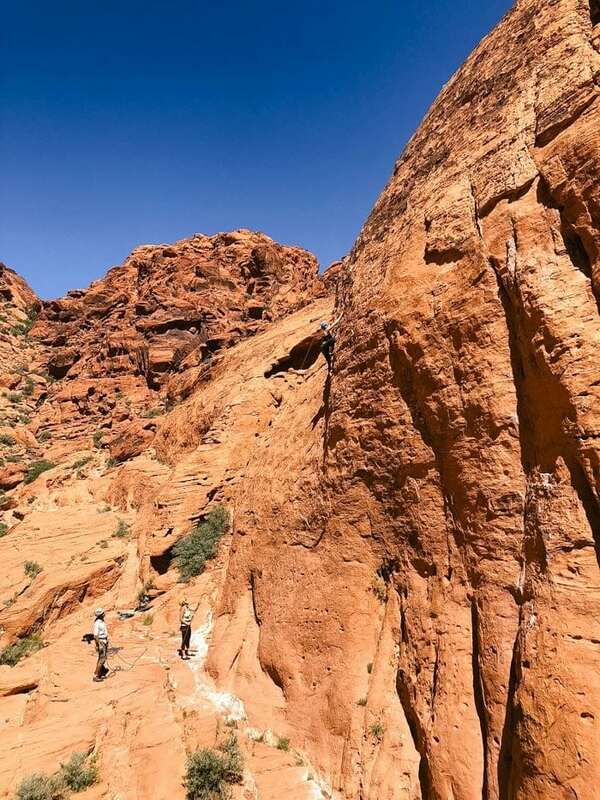 If you’ve never heard of Red Rock Canyon, it’s a fantastic part of Nevada that has so much to offer including hiking, rock climbing, hot springs and more! The best part? It’s literally less than 30 minutes from the Vegas strip. What the what?! Read on to learn about our not so average Vegas trip. We’re sharing what we did, where we stayed, what we flew, and what we ate! Yeehaw. If you haven’t already heard of Thrifty Traveler, NOW IS THE TIME. They’re based in Minneapolis like we are, so we were thrilled when we randomly ran into them at a local coffee shop and got to talking. They’re on a mission to serve up awesome flight deals to those looking to not spend a fortune on travel, but still see the world (uh, HI, that’s us!). And this is where we found this killer MSP > LAS deal. Seriously, it was like $150 a person to fly direct from Minneapolis to Las Vegas on Delta for the dates we went. We have Premium memberships with Thrifty Traveler, and we’re already eyeing international flights for later this year. Anyway, Thrifty Traveler Premium allows us 1st access to insane international deals out of MSP as well as many other major airports in the US every day. Subscribe to their free flight deals HERE (flight, hotel and travel card deals!). Or up your game with the Premium membership HERE. After flying in super early and having a hearty breakfast at The Blue Skillet, we drove directly to Valley of Fire State Park. It was crazy that we had just left the city about half an hour before winding around a corner on the single lane highway and seeing exactly why this park has its name. Red rock emerged from the sandstone and desert landscape, and it reminded us so much for our time in Utah last year at Moab, Arches and Canyonlands National Park. 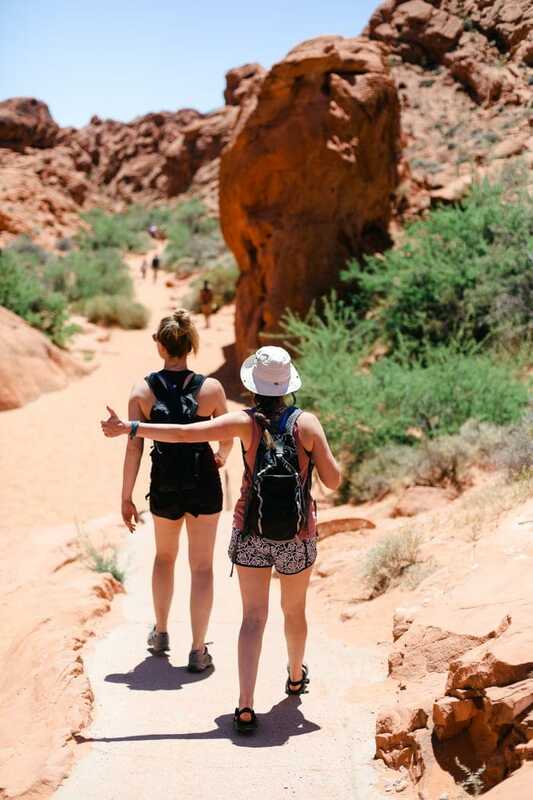 Each of these hikes had a gravel parking lot at the trailhead, so you could definitely just do one or a few of these great hikes when you’re in Valley of Fire! We decided to dedicate the next day to a longer hike. And it was EPIC. 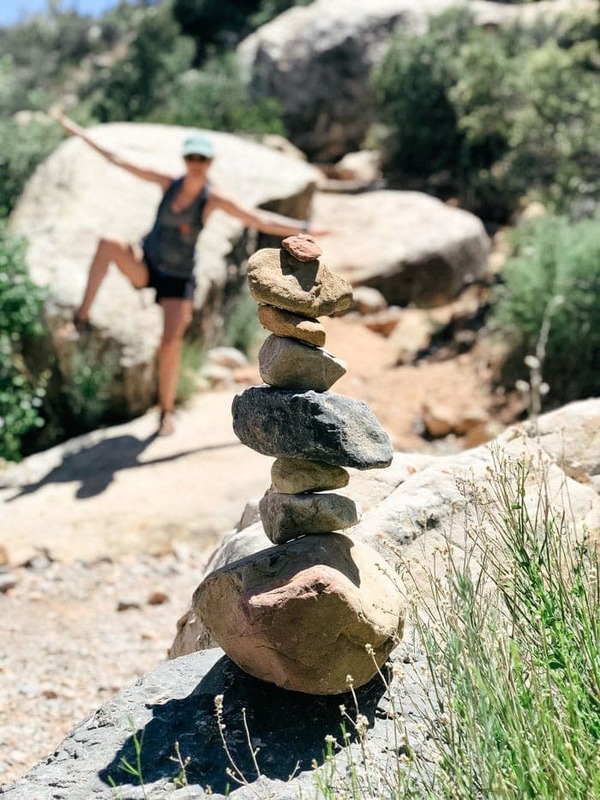 We loaded our backpacks (we packed pb & banana sammies, Lorissa’s Kitchen, trail mix, RX Bars, apples, and tons of AGUA…seriously, tons of water. We each carried 3 liters! 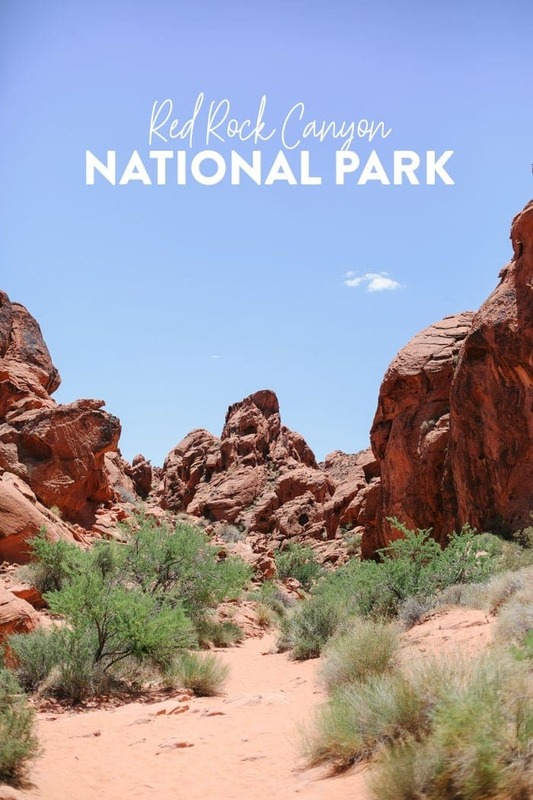 ), drove about 15 minutes from our AirBnb to the Red Rock Canyon National Conservation Area and bought at day pass for $15. We parked right at the visitor center, where everyone we talked to had recommended we start the Grand Circle Loop hike. The Grand Circle takes you on a full loop of the park over 11.7 mi, and allowed us to cross foothills, river washes, do some scrambling up and down red rocks. We decided to take the loop counter-clockwise, which allowed us to do the tougher part of the hike first when it was still pretty cool in the morning, and the flatter portion in the afternoon heat. 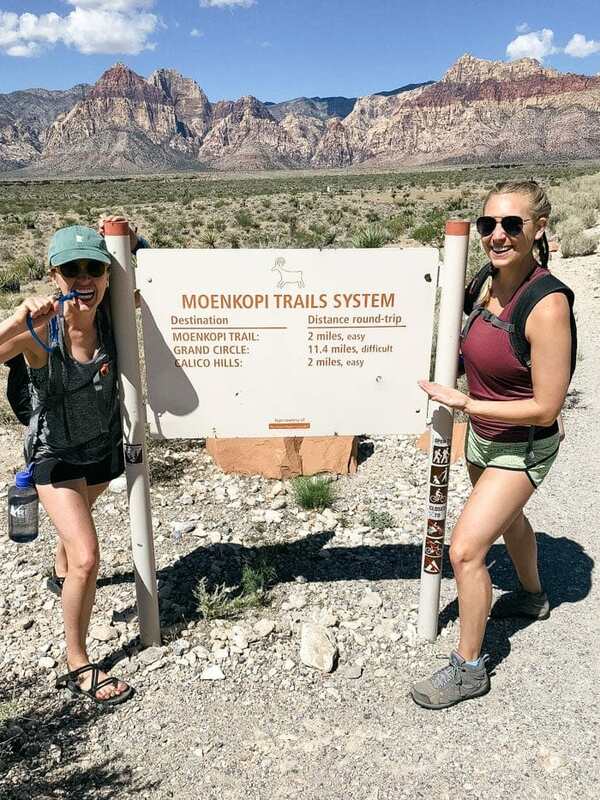 There weren’t any water fill stations on the loop, but there were a few trail heads that we passed with pit toilets (+ you know we’ve never had a problem going #1 or #2 in nature!). We snacked along the way, and stopped about halfway through and sat in the shade for lunch. The whole loop took us about 6 hours and we’d do this hike in a heartbeat again. 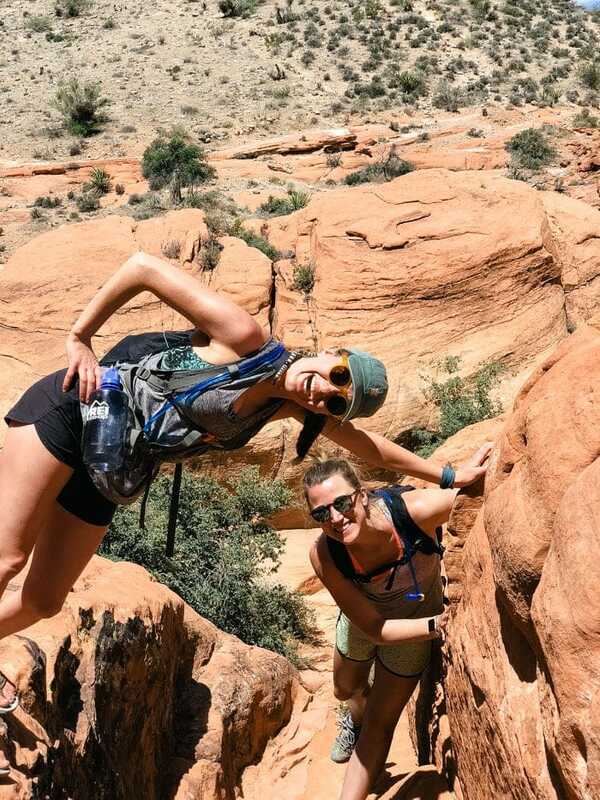 Definitely, a must-do if you’re in Red Rock Canyon. 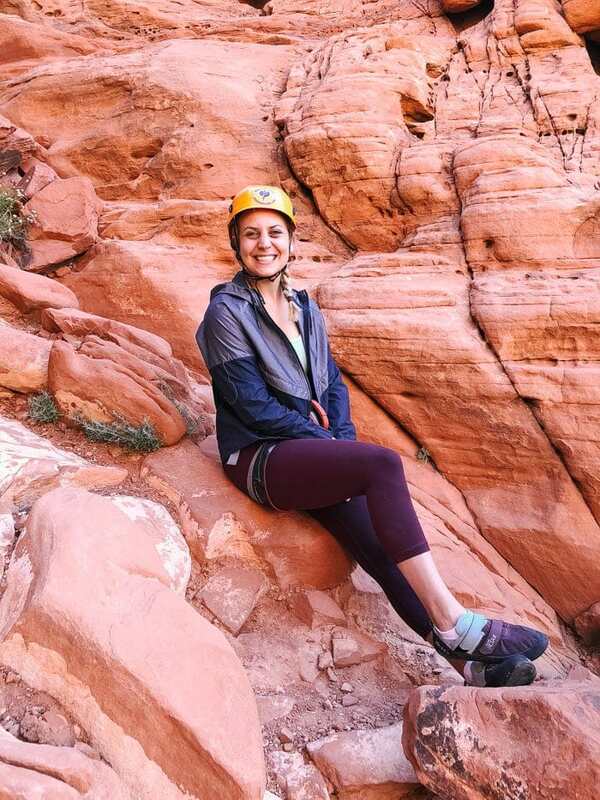 We had heard so many awesome things about climbing in Red Rock Canyon from all our friends at Minneapolis Bouldering Project, so we knew we needed to get some climbing in while we were there. Linley had outdoor climbed once before, and Em and I hadn’t, so we were nervous / super excited to get out there. We booked a half-day climb through Mountain Skills Rock Guides and while it was the most we spent on any activity on our trip it was 100% worth it! We met Jamie, our incredible guide, at 6am and headed out to Red Rock Canyon. We parked and hiked about a mile in with our packs and climbing gear (Mountain Skills covered all the gear, so we didn’t need to bring anything!). 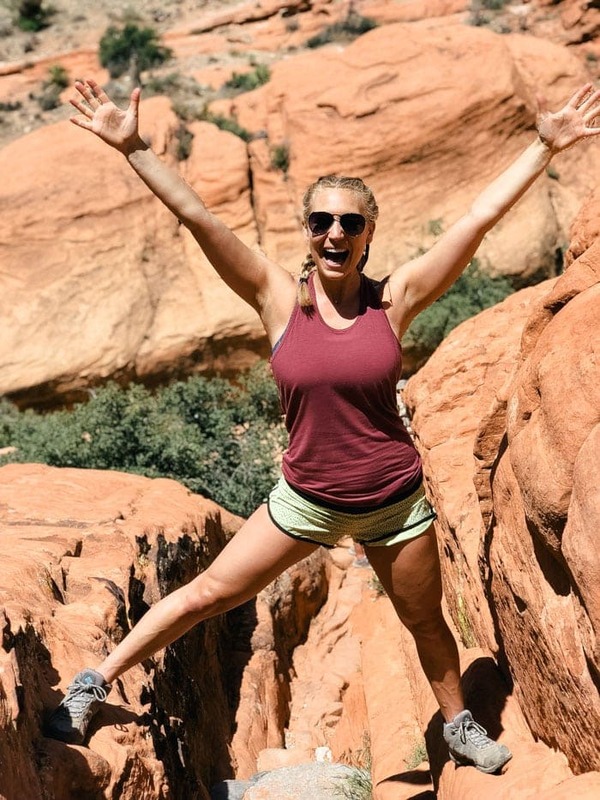 Although we had hiked Red Rock Canyon the day before, Jamie took us to a completely different part of the park, so that was great, too. We cannot say enough good things our guide about Jamie. Seriously. The guy explained everything we were going to do, walked us through all the safety precautions to take while outdoor climbing, and really helped us get out of our comfort zone and try routes that we didn’t think we could do. We started with an easier climb and worked our way up to harder routes on a more vertical climb (with some crazy overhangs!) on the rock face we were on. 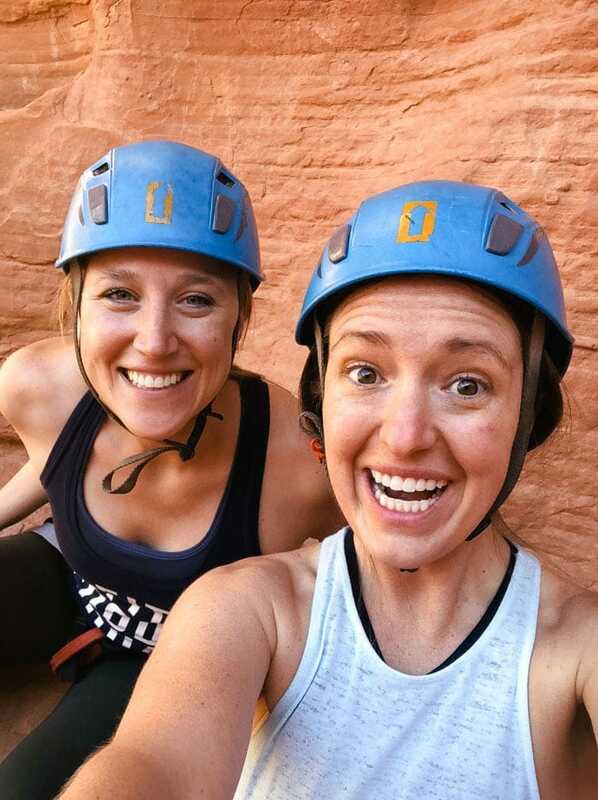 We mentioned that we aspired to outdoor climb without a guide at some point in our climbing lives, so he walked us through how to belay each other, and by the end of our tour, we were each belaying each other! Talk about taking team-building trust falls to the next level. We LOVE LOVE LOVED our time with Mountain Skills, left feeling proud and strong, and cannot wait to outdoor climb again soon. Ahhh our last day! Our feet were tired (and blistered!) and we were ready for a little namaste. We sought out a yoga studio near our Airbnb that offered a free first week of classes, which allowed us to try a class without paying a drop-in fee. And after trying out TruFusion‘s Vinyasa 2 class, we will definitely be back next time we’re in one of the cities they’re located in. This studio was WONDERFUL. We had to be out of our Airbnb by 10 am the day we flew out, so we knew we’d be looking for studios that not only had later morning classes, but also had showers, so we could rinse off before heading to the airport. And I’m so glad we found TruFusion! Not only was the class super restorative, but the instructor offered great modifications knowing my shoulder injury and our sore muscles from hiking and climbing. Plus, they had yoga mats and towels that we were able to use, so this was a great stop for us travelers. So, we showered off, and headed to the airport feeling stretched and zenned out. Good ollll’ Summerlin, Nevada. The crew and I immediately knew we wanted to go the Airbnb route for this trip because we enjoy a mixture of cooking for ourselves and eating out. Air Bnb’s are also super affordable and I just love the amount of space you can get for the price. Summerlin, Nevada is technically still Las Vegas property, but it’s the far west side and buds right up to Red Rock Canyon National Park. Yes PLZ. Summerlin is very suburban like, but I loved what it had to offer. There were a variety of shops, malls, restaurants, etc. We stayed in a 3 bedroom townhouse that had a beautiful kitchen and also gave us access to a pool. YAS, I’ll take it. It was a whopping 8 minutes from the entrance of the park, which was ideal for our hiking/climbing plans. Airbnb vacations are great because you can do a nice combination of eating in and dining out. This is exactly what we did! We stocked up mostly on breakfast food, snacks, and booze, and them ventured out for dinner! 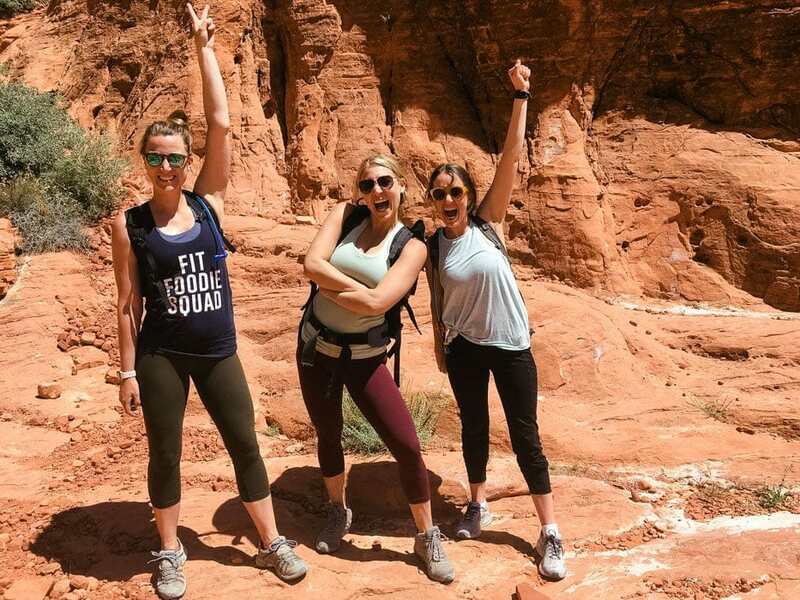 Check out all of the places we hit up in Vegas! Cottonwood Station: Talk about the most adorable bar/restaurant in the whole wide world. If you are remotely near Red Rock Canyon I 100% suggest you stop at Cottonwood Station. 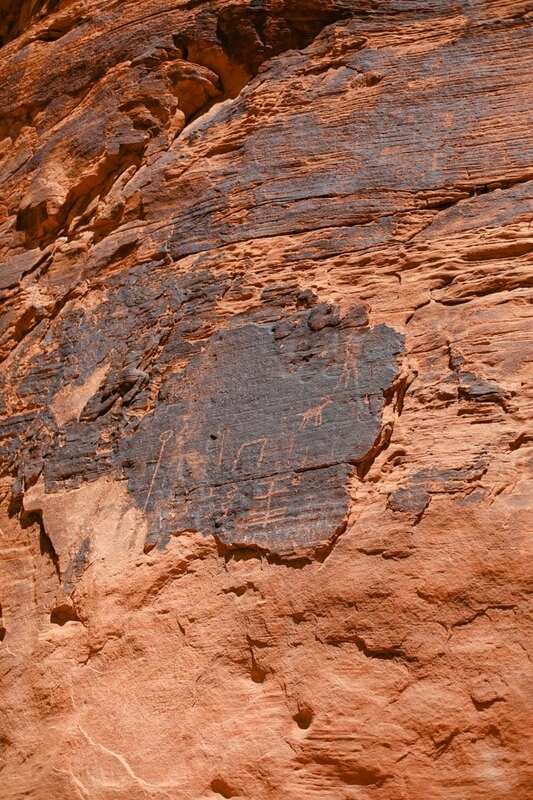 It’s actually located in Blue Diamond, Nevada, a VERY small town just outside the park. They have local beers on tap and a small, but mighty menu including salads and pizza. Skinny Fats: This restaurant came highly suggested by YOU. It sort of reminds me of Fit Foodie and Fat Foodie all in one. They have a double-sided menu with healthy options and naughty option. They’ve also got a great selection of beer and cookies too! Bowlology: I am officially on the poke bowl train and Bowlology did not disappoint. They had an excellent selection of smoothie bowls as well as poke bowls and more! Handel’s Homemade Ice Cream: When in doubt, find homemade ice cream. Handel’s did not disappoint! Lin and I got oreo and Em got Blue Moon (weird, right!). Sushi Koma: We ordered out one night. Sushi Koma was great, but things were definitely a little backed up with our order. Great sashimi. Meals at the Airbnb: Like we mentioned above, we did a combination of eating in and eating out. We stopped at a local grocery store to stock up on breakfast food, charcuterie, booze (lots of beer and wine), and snackies. Here’s the rundown of what we made: steak salad, eggs and avocado toast, kale salad, and hard-boiled eggs. And that, my friends, is how you do a not so Vegas trip…Fit Foodie style!